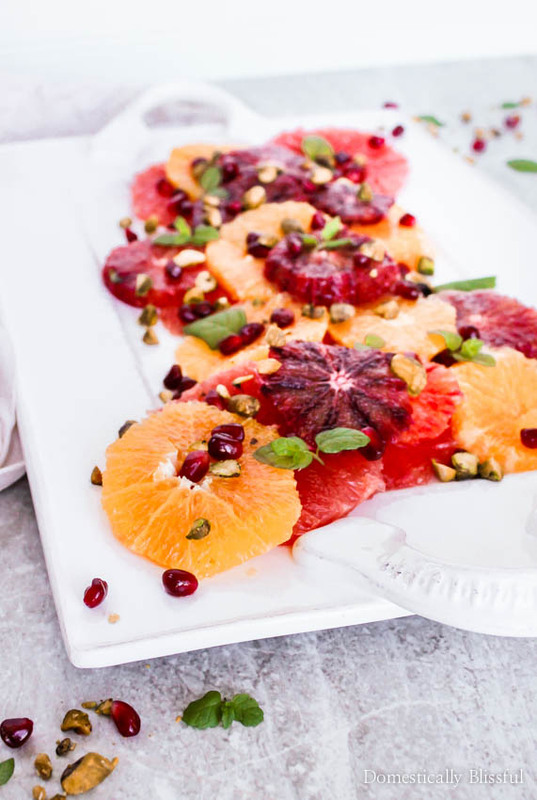 Enjoy your vitamin c this season through this beautiful & tasty citrus fruit salad garnished with pomegranate seeds, pistachios, mint, & a drizzle of honey! Raise your hand if you are trying to eat healthier this year! I definitely am, at least for this week! But seriously, I try to not make “eating healthier” a new years resolution because I know I will break it within the first few minutes of the new year. Plus, it feels like such a blanketed statement with no clear direction, because eating healthier means something different for everyone. For some, it may mean completely cutting things out of their life, such dessert, sweet drinks, cheese, or dairy. But cutting something completely out cold turkey can be rather difficult. Being & eating healthier can feel like an uphill battle. Especially now that it’s the end of March & it feels like all of our resolutions are starting to fade into the background. So I try to make mini goals instead. Near the beginning of December, Roger & I made a new goal to drink the correct amount of water for our body weight. I know that can be a little confusing because you probably grew up hearing that you need to drink 8 cups of water a day. But if you think about it, that makes no sense! How can a man & woman at two different heights & weights need to drink the same amount of water? So we did what every millennial does when they have a question. So instead of trying to drink 8 cups of water a day, I need to drink 9.25 cups of water a day. 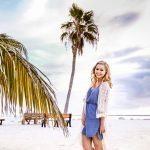 In January I decided to try to add on “eating more fruit” to my lifestyle. And while grabbing an apple or a banana on the way out the door is an easy way to increase your intake of fruit. 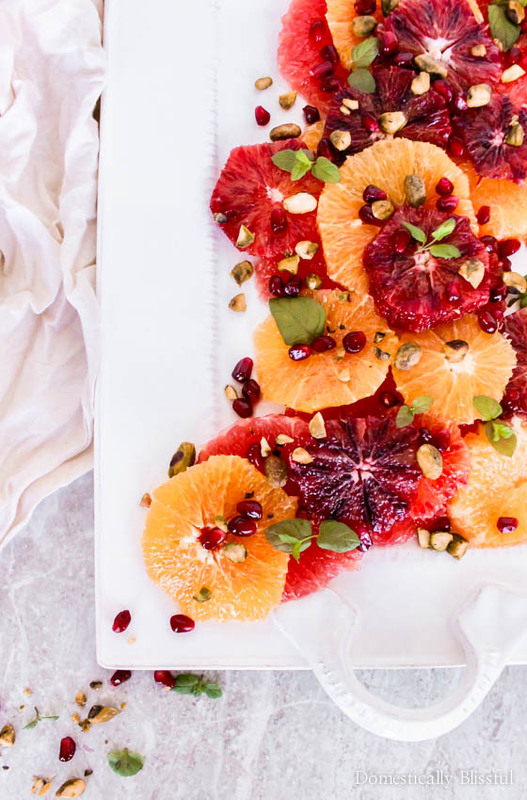 I thought it would be fun, & delicious, to create a pretty winter fruit salad. The only problem was I could not find blood oranges anywhere! 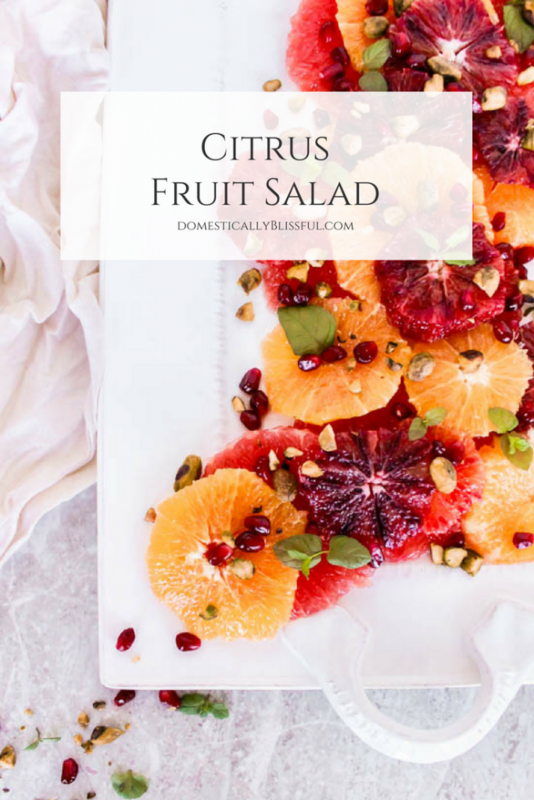 Luckily I finally found some just a week before the first day of spring so that I could still make this salad & claim it as a Winter Citrus Fruit Salad. 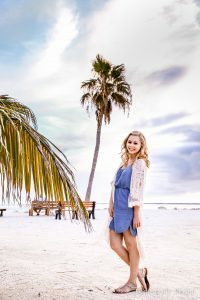 This is something you could make up & eat throughout the day, all weekend long, or even create for a family brunch or late night snack with your friends. 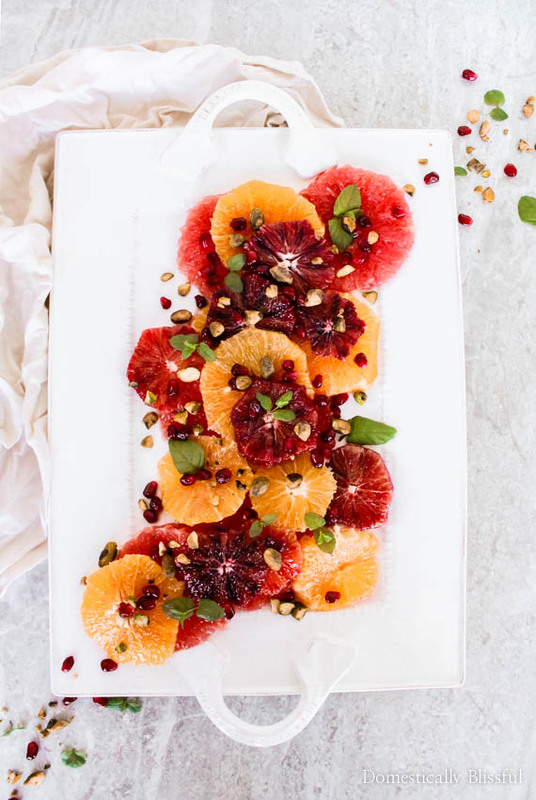 And not that your fruit needs to be any sweeter, but I found that adding a little drizzle of honey on top can make it feel like an extra special treat! First, remove the peel from all of the citruses. Then slice into circles. 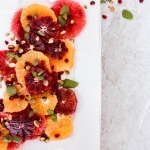 Place the citrus, the pomegranate seeds, & the chopped pistachios on a serving plate, top with mint & a drizzle of honey. 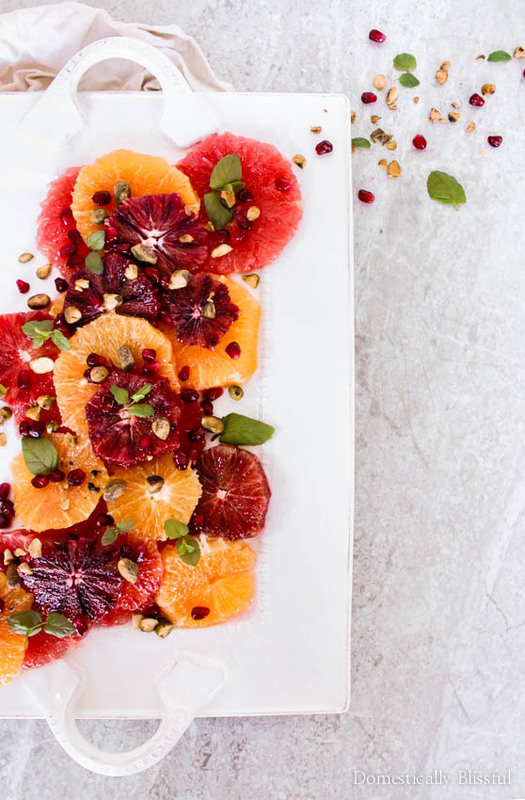 What is your favorite way to enjoy fresh fruit in the winter? This looks so bright and yummy! can’t wait to try it. Thank you, MaAnna! I had as much fun making it as I did eating it. 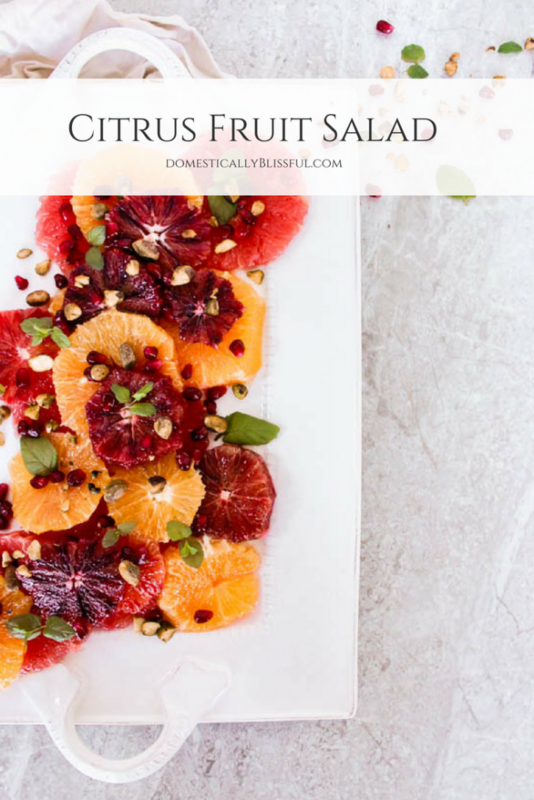 I hope you enjoy your citrus fruit salad!